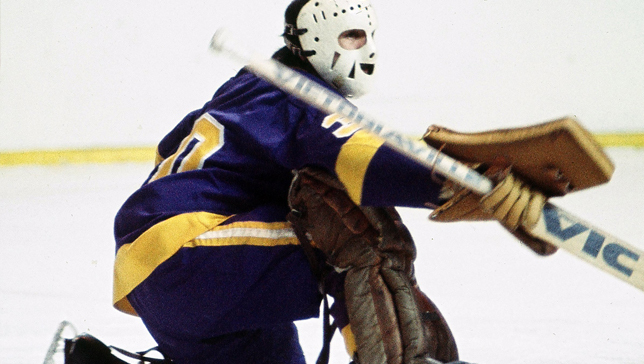 Goaltender Rogie Vachon began this series by posting back-to-back shutouts in Game’s 1 and 2 for the 7th-seeded ’74-’75 Kings. He didn’t face many shots, but he stopped them all. The 2nd-seeded ’11-’12 Kings did not generate much offense at all in this series and their highest shots on goal total in a single game was just 21 in this series. The ’74-’75 Kings won Game 1 by a score of 3-0 with Tom Williams leading the way offensively with two assists. Then, they won Game 2 by a score of 2-0 as Williams and Dan Maloney were the lone goal scorers. The ’11-’12 Kings finally got on the board in the series with a 2-1 win in Game 3 as Anze Kopitar scored the game-winner in the third, but that would be their lone win in the series. The ’74-’75 Kings got back to their winning ways in a big way with a 5-2 win in Game 4. Bob Berry scored twice and added an assist to lead the ’74-’75 Kings offensively. They then wrapped up the upset with a 2-1 win in Game 5 where they scored both goals in the first period. With this upset now, both of the Cup-winning teams in the Kings’ history have been eliminated in the First Round of the Qualifying Tournament. Up next in the 3-6 matchup are the ’92-’93 Kings and the ’90-’91 Kings! This entry was posted in Qualifying Tournament, Ultimate NHL Playoff and tagged Anze Kopitar, Bob Berry, Butch Goring, Dan Maloney, Frank St. Marseille, Jack Johnson, Jonathan Quick, Juha Widing, Los Angeles Kings, Mike Murphy, Qualifying Tournament, Rogie Vachon, Tom Williams, Ultimate NHL Playoff. Bookmark the permalink.